In the following conversation, translated by David Broder, French journalist Aude Lancelin and political philosopher Alain Badiou are joined by Syriza central committee member and Jacobin contributor Stathis Kouvelakis. Their discussion focuses on the tense negotiations between the European Central Bank (ECB) and Greece, as well as the historical roots of Syriza and what options the party now has. The exchange is well worth reading in full, especially in light of yesterday’s news that Greece is drawing up plans to nationalize the country’s banking system and introduce a parallel currency. It’s a little over eight weeks since hope arrived in Greece with the election of Syriza, a formation of the radical left determined to break with Europe’s austerity policies. Today, it looks like there’s a very uneven test of strength under way, with the troika reasserting its authority (even if with a euphemistic new name) and the Greek government having to juggle a terrible liquidity crisis (which Stathis is going to tell us about), with its future prospects now looking very difficult indeed. So a first question for Stathis: can we say that Alexis Tsipras and Syriza as a whole were too optimistic in terms of the amount of pressure they thought they’d be able to put on the European institutions — starting with the European Central Bank, which was the first to strike after Tsipras’s election? I think that Syriza — its leadership, and also its activists — knew that this wasn’t going to be a walk in the park. I think that what happened was largely to be expected — and I am not the only one to think that. So it had to cope with this very difficult situation, and when it finally signed the February 20 deal it faced the prospect of the banks not being able to open the following week. Since the start of the election campaign, there was constant movement of liquidity withdrawal, and the beginning of a banking crisis, which accelerated with the ECB decision. This is a classic problem: all left-wing governments in the world who were determined to change things ended up faced with this kind of obstacle. At the heart of this question, is Syriza’s, or its leadership’s, decision to break with austerity within the framework of the European institutions, and, more particularly, within the terms of the eurozone. This was the basis Syriza was elected on, and this has been its line throughout the last three years in particular. This is not at all what it is about. These institutions are there in order to lock in extremely harsh neoliberal policies, to lock in the troika supervision of entire countries. And that’s exactly what they’ve set out to do, forcing the Greek government into making retreats — very serious retreats — in the February 20 agreement. And indeed the troika has made its reappearance, renamed as “the institutions,” and at this very moment the teams of troika experts are in Athens scrutinizing Greece’s accounts. What’s new though, as compared to before, is that there has actually been a bras-de-fer — and it’s still continuing. Syriza has been forced to make a retreat — and indeed, within the terms of this strategy it simply had no other choice. “Within the terms of this strategy,” to be clear. Now the European Commission has even tried to order the Greek government to hold off passing two bills that are currently being discussed in the Greek Parliament: one on so-called humanitarian measures, to deal with an emergency situation and meet some basic pressing needs; the second, concerning people who are behind on their tax payments. And the government has decided to press ahead. So ultimately that’s what’s different about Syriza: that there really is a confrontation underway. There has been a retreat — we have to be clear on this — but the confrontation isn’t over yet, and it will particularly be fought in the next few months, over summer, which will be decisive. And we have to reflect, and put an alternative approach in place in order to avoid a repeat of what was decided in February. Alain Badiou, are you surprised by this turn of events? I should say right from the start that in this kind of situation, I don’t want to wade in like some sort of know-it-all — the skeptic who can see everything in advance. I hate that kind of posture. After all, here we’re dealing with uncharted territory, and when you’re addressing something new, by definition you need to look at how it develops, its inflections, the contradictions it raises. But this is the question I want to pose Stathis: Syriza’s project is to produce a rupture with the old policies — not only that, a rupture with the policies that dominate Europe as a whole, and indeed the whole world. That means asserting a very strong singularity. So it seems to me that we can currently see a contradiction at work between the newness of this project and the political method used to achieve it. Its current method is a classic one: occupying the heights of power within the terms of constitutional/electoral legitimacy, and then proceeding to maneuvers and negotiations with the “partners” — or as you rightly point out, the enemies — hoping that all this can lead to an effective resolution of the situation. But as you say, the enemies aren’t playing that game: that’s not their approach. And it’s very important to understand that. So how do you think Syriza, political forces in Greece, and ultimately the Greek people as a whole, can engage with this situation in a different way from what has gone before? Classic? Well, yes and no. If we examine the current Greek sequence, by which I mean the last five years, we can see that it features some very classic aspects, others much less so. What is less classic in this sense is the fact that Syriza would never have come to power — having been a small party until just a few years ago — if not for the emergence of popular mobilizations and social movements in Greece, which are without a doubt greater in scope than anything we’ve seen in Europe since the 1970s. And it’s no coincidence that the other country in Europe that’s witnessed similar mobilizations — indeed, ones that are innovative in several regards, with the occupation of town squares, not to forget the dozens of days of general strikes in Greece — is Spain, which also has its own Podemos phenomenon. So there’s an interaction between popular mobilizations and political processes, which are also expressed at the electoral level, and I think that’s absolutely crucial. And it’s something new in Europe: we’d seen something similar in Latin America in the recent period — and even earlier in Chile, with Salvador Allende’s Popular Unity — but also more recently, for instance, with Evo Morales coming to power in Bolivia. But in any case, I think it is certainly new on this continent, or at least in Europe during the historical cycle we’re in. So, Syriza’s election is the product of that mobilization but the temporalities of the present cycle, the social temporality and the temporality of the political process, are not synchronized — that would too much asking. And that’s why politics and strategy are necessary. Nor are these temporalities synchronized at the European level, and that’s something we ought to recognize. There will be no miracle solution spontaneously emerging from below and powerful enough to overthrow the whole balance of forces in one fell swoop; it’s more complicated than that. But the fact that Syriza has been able to get as far as it has done thanks to popular movements also allows us to say that its coming to power makes for the possibility of a new cycle of mobilizations. And we saw as much in the weeks following its election. Something quite exceptional happened then, which [Prime Minister] Alexis Tsipras himself underlined in his general policy statement at the very beginning of February. He finished his speech by making an appeal to the Greek people to mobilize, to take to the streets, and to the town squares. He asked them to uphold the constitution, invoking its final article, which is similar to the one in the French 1793 Declaration of the Rights of Man, which specifies that the constitution resides in the people and its patriotism, in the French 1793 Jacobin sense, its right to rise up. And indeed we saw something that I thought was unprecedented by European standards, with tens of thousands of people taking to the streets of Athens simultaneously both to support the Greek government in this confrontation with the [European Union], but also to put pressure on it. And that continued right up till February 20. This movement also spread to a European level: February 15 was a Europe-wide day of mobilization in support of the Greek people. In several cities thousands or even tens of thousands took to the streets to demonstrate, for example in Paris, but also in Rome, and other cities too. In this recent period we’ve seen the hope you talked about also translating into action. Would you say the strength of popular support for Syriza in Greece has kept up, even though some of its campaign promises seem to have been put on hold — or, at least, they might face criticism on such grounds? The popular support is still very strong, and indeed it amounts to a lot more than Syriza’s own electorate. And just like in 2011 the people mobilizing in the demonstrations came from far beyond the ranks of habitual march-goers, or even Syriza’s own base. At the same time, well beyond that, Greek society in general is becoming conscious of the difficulties it faces. It won’t be taken in by any simplistic accounts about what’s happened. It knows that it’s very difficult and that there’s an enormous amount of pressure and that the power relations are heavily unbalanced. So now we’ve arrived at a different point, but I think we need to re-establish the conditions for continuing precisely this interaction — between movements, popular mobilizations, and the battles that will follow on the institutional level in Europe and internationally. I totally agree with what you just said, and that really gets to the heart of my question. Which is about whether this political novelty — and politics, as we’ve been saying, doesn’t mean just the existence and the actions of the state, but also the interaction, and the mobility of the interaction, between popular movements and the state – is playing out in a new and unprecedented fashion. I am well aware that the Greek situation has all sorts of significant, interesting, even unprecedented characteristics, from that point of view — absolutely. And even across a period of several years: we can remember the 2008 insurrections, etc. So the story in Greece is a story of popular movements, of uprisings, people taking to the streets across a number of years, that’s true, I totally agree. Syriza — and Podemos, each operating according to its own register — are a product of this singularity of recent years, not only with regard to classic politics but also in terms of “inventing” politics . . . The question that’s bothering me , I might say, perhaps excessively motivated by the eventual outcome of the [François] Mitterrand government, is the following one: when Mitterrand was elected — and this victory had also been on the horizon throughout the 1960s and 1970s — tens of thousands of people took to the streets to celebrate his victory. But very quickly we saw the emergence of a type of government action that very quickly abandoned all that, little by little retreating into the traditional workings of the state order, giving in to conjunctural imperatives. And that broke this movement. All that happened within about two years. Now with Syriza we’re not two years in yet, but all the same I’m rather haunted by this image. And I certainly hope, very much so, that this time around won’t be a repeat of what happened then. You wrote in one of your pieces that the danger here is that if popular mobilization isn’t able to control the state’s actions, via the mediation of the organization that this movement created or made possible, state institutions themselves will bring everything back under control. I was very struck, at the time of the Mitterrand period, by the speed with which we saw, with which we could read, this kind of “statization.” Particularly when it came to economic and financial policy: remember, Mitterand had an extremely ambitious program of nationalizing central parts of the French economy, most of the banks, etc. — and indeed he did so. But despite all that, I think that in the long run a political method, a way of being political, is all-determining, and that’s why I asked you — whose readings of Syriza I find so fascinating — if it does express a new type of relation — new for Europe in recent times, at least — between state processes and popular movements. For me that’s the heart of the question. All the same, the Syriza leaders are very different in profile from Mitterrand: Tsipras came from a radical left, or even communist, background, whereas Mitterrand’s political coloration, as a longstanding politician at the end of his career, was much muddier. It was less clear, yes, but even so, the Communists were in the government, and its stated objectives were much more radical than those of Syriza today. For the moment its political program is mainly negative — “no to austerity,” “another way is possible,” but its contours are not very specific . . . it makes no explicit challenge to private property, though that’s at the heart of the communist tradition. But I’m not worried by that, I understand perfectly well that the question of its immediate program initially has to be proven through its first decisions in government. What interests me in the new scenario is precisely the possibility of a new dialectic between the popular movement and state actions, which is why I asked you about it, that’s the new and different thing. Syriza’s leadership is made up of new kinds of organization, but that leaves us with the question of whether its way of engaging with the state is new. I agree with what Alain Badiou just said. Just one word on the program: I think that a program’s radicalism is best measured in terms of the conjuncture, and not in the abstract. And in the current conjuncture, even very modest or moderate demands take on what I would even call revolutionary dimensions. As we can see, today to demand the cancellation of the debt is to draw a sharp demarcation line, disorganizing the enemy’s forces. And this enemy also knows where the dividing line, the point of conflict, now lies. We need to inflict defeats on neoliberal policies, and the Greek example shows that movements and mobilizations are the indispensible condition and the starting point of this process, but they do not alone suffice. We have to take over the state but without being wholly taken over by the state. That’s the whole problem. I was in France throughout almost the entire Mitterrand period, and I was struck by the fact that the only sector of society to mobilize — indeed, very soon after the Left’s victory in 1981 — were the car workers. And for the most part, indeed these car workers were immigrant workers. Which the government explicitly attacked. Exactly, that was when Pierre Mauroy [the prime minister during the first three years of Mitterrand’s presidency] made statements such as the claim that these strikes were being manipulated by Iran, by Islamists, etc. It was a crucially important episode. Yes, it was a crucially important, particularly in the sense Alain Badiou has been talking about, the question of political method. If a government makes clear that a part of its own base — indeed, a highly emblematic one — is seen as its enemy, and that it considers such a mobilization as a threat, then the process is clearly going in the wrong direction. The other important level at which the Mitterrand government failed was, indeed, the European one. The choice it faced at the time was whether to exit what was then called the European Monetary System — meaning, continuing with a policy of active state intervention, in the direction traced by the nationalizations and giving a stimulus to the economy – or else to remain within the European framework and make a neoliberal turn. And it went for the second option. All things considered, Syriza’s options today are not really that different. Either it takes a path of rupture with the European framework — and the contours of that move would have to be explored, that’s the main challenge for Greece’s political and social forces today — or else it will have to give in, which would be a very heavy defeat with potentially disastrous consequences. Not only for Greece, but also for the whole political struggle going on in Europe at the present moment. Indeed, I wanted to talk about the euro, as you’ve just referred to. Some observers would have us believe that Tsipras wanted to buy these four months — that is, before the next round of negotiations in June — precisely in order to secretly prepare the ground for eventually pulling out of the eurozone. Or you hear at least some people saying that. You know what is happening inside Syriza. So what exactly is the balance of forces between the internationalists — in the broad sense, that they stick to the idea that a break with Europe is unthinkable — and those, including yourself, I believe, who don’t agree with staying in the eurozone at whatever cost and regardless of the consequences. I have just a little objection to one term you used there. I can’t accept it being said that those who insist on staying within the eurozone, including the Syriza comrades with that kind of position, are internationalist while the rest of us are not. Even if I think that these comrades are internationalist, and this is also the way they think of themselves. Personally I would say that the European Central Bank has nothing to do with internationalism, I don’t see the slightest hint of internationalism in Mr Mario Draghi, and I think internationalism is on the side of those are now opposed to Mr Mario Draghi, his politics, and everything he embodies — including him personally, physically. This question of the euro has always been the object of intense debates within Syriza. And it’s posed as follows: there’s this view that given that leaving the euro would lead us into very serious problems — and this is true — for instance in terms of its potential effect on purchasing power and the country’s productive activity, we are better off trying to fight our battles within the existing institutions. The idea is to base ourselves on public support and the movements that are out there, and fight a battle that takes advantage of the current contradictions in Europe. But now we’ve seen that this doesn’t work. The four months we’ve “won” are not four months of breathing space. The country is still under extreme pressure and constant blackmail. In fact, the Greek state is on the brink of not being able to pay its bills, and it faces a continuing series of loan repayment deadlines — by no means did the deal put a stop to this infernal machine of debt. It is quite possible that next month it will find itself unable to pay civil servants and pensions, and face a situation of insolvency. The same goes for the Greek banking system, which is extremely precarious. But I think the line is changing. So that’s where we are at the moment, in sum. In my view, there’s no other way, and that also goes for the European negotiations. If the enemy — and it is an enemy — knows in advance that there is a line that you won’t cross, he’ll naturally focus all his pressure exactly there. And that’s exactly what’s happened, and will continue up to the point of besieging Greece and forcing its capitulation. But how much of Syriza is prepared to make such a break? To quote an interview you gave in January, before the election I think, to Jacobin magazine, you said that for some Syriza leaders, “avoiding the break with the euro at any cost acted as almost a mythical guarantee for an internationalist and socialist perspective.” And that’s what’s orienting Syriza’s policy at the moment. So what’s the balance of forces among these tendencies — how many people agree with your line? It’s really hard to describe a balance of forces, in such a tense situation, because what we really have is fluidity. What I said in this interview is that I think the Greek situation is one where there’s no middle course between rupture and capitulation. This isn’t a scenario that plays out in one instant, it lasts some time — but there’s also a limit how far it can go on, and in my view it will be resolved one way or the other in the next few months, by the summer. This short, dense period will see the resolution of a lot of issues and contradictions both within Syriza and in Greek society more broadly. I wonder, though, whether in reality the choice you present as being at the end of the current scenario, its future horizon, of doing everything that staying in the euro demands and thus letting the enemy know that one way or another you’re ultimately going to capitulate — entirely so, giving in on all of your main principles as far as the enemy demands — is not in fact constitutive of the current situation. On the other hand, the question of where the Greek people will find the possibility of resolving the current situation is a lot more complex and unclear. Something that really struck me in the recent period is [former French President Valéry] Giscard d’Estaing shifting toward a view supportive of Greece leaving the euro. He’s no friend of yours in terms of the rupture and all that, but he said things anyone might find reasonable, that Greece should leave the euro and go back to the drachma, so it could undertake major devaluation, and, in that context, little by little reduce the debt. So even a man like him can say that all things considered, Greece leaving the eurozone would be best for everyone concerned . . . doubtless it would cause problems in Greece, but you’d have to take care of that, and ultimately we could see what the lay of the land is after you’ve devalued your new currency. I mention that in order to emphasize that the tension over this issue is a question of tactics, a conjunctural question concerning your relationship to Europe — but what would be the political, popular, programmatic basis for such a measure in terms of your positive vision of Greece and the future of the Greek people? This is a question which is being very much debated at the moment, also in various technical aspects, of leaving and devaluing or staying and persisting. So what I’m asking is how you see the next phase, or a bit beyond — and some would say that communists’ task is always to see the phase after next! I’m interested in what you see as coming after this current battle, even if I can understand that this itself has all its own ins and outs and raises all sorts of tensions both within and outside Greece. We’re in a moment of crisis. At such a moment even the adversary, not only our side, is hesitating between various different strategies. For the moment, though, the dominant strategy isn’t the one you mention, though it does exist: part of the German elite also agrees with Giscard’s position, that it’d be better to cast off the Greeks, from some points of view even at any cost. But what the dominant forces in Europe really want now is to shake down the country. They want to keep Greece in the “iron cage” and force Syriza to do what all the other governments of the Left in Europe ended up doing. They want to show that Syriza is just the same as all the others, that it’s inevitable, that there is no other way. That’s their real strategy, to show that Tsipras is no different from [French President] François Hollande, no different from [former Italian Prime Minister] Romano Prodi, no different from what we recently got from the social-democratic left across Europe. And, honestly, that came into my mind the evening of the Greek election, because one of my Syriza friends said that the people hadn’t really voted for hope, so much as for the hope of hope. I believe that’s where we’re at, in a phase where our task is to break out of the straitjacket. And it’s then that the question of possibility will really be posed, in the flesh, if you will. I would also pick up on another of the themes you raise in your writings. Like you, I believe we need an idea, and that there’s no other word for that idea but communism. But for me communism isn’t just an idea, it’s also, if you like, the real movement. So there’s a tension there. And I think that the Greek situation perhaps allows us to pose this question once again. Not in simplistic and naïve terms as imagining that Syriza “is” communism — I am not saying that at all. But rather, that the sequence we’re currently living through, this experience and the various elements underlying it, allow us to return to this question because it offers elements of an answer. Not a ready-made answer, but elements that allow us to work on it once again — including a point that you’ve notably left aside, namely taking over the state. And by that I’m talking about more than elections — to become the government is something quite different from holding state power! But we need to take over the state in order to win victories, to break off the straitjacket, and to break with the internalization of defeat. Across a whole period the radical left has suffered from this, internalizing its subalternity, and to overcome this situation we need victories — not one, but several victories. What happened in Greece was not the victory, but it was one victory, and one that points in this direction. I totally agree. I myself experienced Syriza’s coming-to-power in exactly the sense you describe, as a victory that clearly changes the regime of possibilities in Europe today. Certainly. I wasn’t among those of our friends who talked about voting Hollande with a view to perhaps opening up some new possibilities, only to find out eventually that wasn’t the case at all — I could see that much, at least! To put it in more schematic terms, in this matter there are three terms and not only two. There are the end goals, there is the movement, and then there is the procedure by which we engage with the state. Naturally this is only possible thanks to the movement, yet at the same time in reality it is executed or realized by clearly identifiable, organized political actors. And in Greece, Syriza is the name for the new way in which politics is organized, in terms of the relation between popular movements and the state, a relation that it has itself transformed. That’s a more abstract way of describing the situation. So my question is what you think will become of this dialectic, not just right now but also in the near future. So I can see Syriza’s engagement with the state, the beginning that represents, with its involvement electoral process — and if something good comes of that, then great! Then I can see what remains of popular pressure and popular mobilizations in Greece. These movements were, however, in decline before the election. It’s not like Syriza won the election because they were on the rise. That’s the way thing usually go. In France in June 1936, the great social movement came after the election, in Greece it came before, but in neither case were these moments synchronized. But anyway, what I don’t see clearly is the third term, by which I essentially mean how the other two terms are articulated in the figure of the political movement, which in the last analysis means Syriza — it is the political movement, and it’s taken on a very important role. I’ve been following what you’ve been writing very closely, and to me it seems that Syriza is somehow fragile. That’s something that’s really struck me about it. By that I don’t just mean the disparate origins of its component parts, but the fragility resulting from what is probably a still minimal agreement among these different elements, an agreement that probably isn’t up to the task of immediately addressing the conditions of the party’s engagement with the state. The conditions, as you rightly put it, for really taking power, for really taking over the state. So I wonder what you would have to say about the relation of these three terms, from Syriza’s point of view, as it were. I think Syriza allows us to make some progress in terms of dealing with the question of the party form. Of course it is a project in becoming: one that still has open prospects ahead of it, and which is itself a site of contradictions. So we have to find a way of dealing with all that. Syriza is an attempt to bring together the revolutionary movements and radical left cultures inherited from the twentieth century, and make them work in a common endeavor. But sometimes it seems like these cultures coexist without yet succeeding in producing a new political culture, even if there has been some progress in that direction. Besides, exercising governmental power itself brings up all kinds of contradictions and problems, not necessarily the obvious ones. For instance, we can see a strong tendency pushing the elements of the party who are most engaged in the state apparatus to become increasingly autonomous from the rank-and-file and even from the party, while other elements are immersed in social movements and practices. So Syriza is itself internalizing these contradictions. We’ll have to see in what sense the development of the situation allows these contradictions to be resolved, hopefully in a productive way and without the kind of fragmentation and factional division that has so often affected organizations of the Left in the past. Even if we know that of course there will be contradictions, clashes, and debates within the party. As for its political project, I’ll tell you something that doesn’t express a personal view so much as a wider search that’s currently taking place. Syriza isn’t the be all and end all. There’s also a kind of “network building” from below within Greek society which has been going on these last years, with all sorts of efforts at self-organization, and of movements that while working at the local level often also establish flexible relations among themselves. These movements have had to deal with the urgent demands of the current situation: the state in Greece has really retreated, and this is very important for understanding the brutality and violence of the situation. It’s terrible when the state shrinks like this. And, as Bourdieu used to say, it’s the “left hand” of the state, that is the social state, not the “right” one, that’s retreated. The right hand is doing just fine, we’ve certainly seen that in the recent period, with all the repression and the rise of state authoritarianism. The problem here is the risk that since Syriza’s plan is ultimately to rebuild what’s been destroyed, to rebuild the welfare state and to bring back social conquests, the kind of movement from below, even it is fragile and still insufficient, might just disappear. I think that the task at hand is to rebuild a country that’s been destroyed — its economy and its society have been destroyed — and that we need to rebuild it from below. That will take time, but this reconstruction effort can be the basis for the emergence of very wide and perhaps unprecedented type of social alliances, allowing new practices to develop, and allowing the kind of tendencies we’ve seen sprouting in recent times to grow to a far higher level. Indeed, we can see something of this already: hundreds of thousands of people in Greece in need of medical care rely on a network of pharmacies that exists exclusively thanks to popular initiative — the initiatives of doctors, social workers, activists, pensioners, and students who are organizing things in their neighborhoods that would have been unthinkable for anyone who knew what Greek society was like during the bubble of just a few years ago, a bubble which was of course illusory. Here it’s absolutely necessary to see that there are different levels of mediation. Forms of local and regional power, in the municipalities, for example, that Syriza has been able to take over, often in alliance with other radical left forces. That’s a field of experimentation we need to build on. In 2012, Alexis Tsipras and the party leadership clearly supported such a perspective, even making references to the processes in Bolivia. Tsipras had said that Syriza’s proposal wasn’t about simply a government of the radical left, but a government of the radical left and of the social movements. Hence the references to Bolivia as well as the calls on social movement to organize general assemblies to discuss these kind of questions. That’s precisely the kind of approach we need to proceed with in order to combine reconstruction with a deep-rooted transformation of the structures of Greek society. It’s interesting what you’re saying. Essentially that the possibility of taking over the state — rather than political forces being taken over by the state’s counter-action! — derives perhaps most of all from the fact of the state’s weakening, its having been destroyed. Because you don’t have to try and take over a strong, structured, self-regulating state in the classic sense; and in fact, that’s a difference with the Mitterrand case. Mitterrand was dealing with what was a very strong state, there was no particular problem on that score. What you’re describing is a conjuncture where the crisis of society and the state is so deep that in a sense taking over the state becomes also immediately a matter of reconstruction. Not a question of taking over something that’s functioning smoothly, or ordinarily, but rather one that is in a dysfunctional condition. Its malfunctioning has created the space for horizontal initiatives. In this sense, what you’re really facing is a phase of building something new, dealing with what this dysfunctional state has left in its wake. So your state has fallen apart, and as you say that creates real hardships for the population, but in a sense it also provides a political opportunity. You’ve both mentioned Syriza’s internal fragility, but it is also fragile in another way, I think, by which I mean its solitude. At the start of our discussion, Stathis, you mentioned a solidarity movement promoted by other radical Left forces, as expressed with a thousands-strong demonstration in Paris. But if we might have imagined that countries like France would themselves seek to use the situation to soften their own treatment at the hands of the European institutions — and it seems that Tsipras himself thought this, at one point — in the end, far from coming to your aid, they took a hostile stance. Were you surprised by this? Personally, no, not all. I think there were nuances in Syriza leaders’s appreciation of that situation, insofar as some of them calculated that other governments would have their own reasons to want a changed approach, and that it would be possible to play on these contradictions. Tactically speaking there was nothing so absurd about that, except that when push came to shove all these governments spoke in unison on all the fundamental questions. It’s impossible to imagine that in France Hollande would both pass the Macron bill and at the same time make an opening to Syriza: it’s the one or the other. Let me recall a fact. Alexis Tsipras came to France between the two 2012 elections — he was already the leader of the opposition in Greece — and then he went to Germany. In Berlin, he was officially received by all the parties represented in parliament, except the Christian Democrats, but certainly, and the most significantly by the Social Democrats. In France, the Socialist Party refused to meet with him. Not only that, but François Hollande made an extremely virulent intervention in the June 2012 Greek election campaign, in an interview that was replayed on Greek TV again and again in the days before the vote, in which he told Greeks, don’t vote for parties that talk about a rupture, don’t vote for parties that talk about breaking the commitments that have been made — a formula that totally fetishized the commitments the previous Greek governments had made. At the press conference he gave at the time in Paris, Alexis Tsipras picked up on the slogan Jean-Luc Mélenchon coined to describe the then-newly elected French president: “Hollandreou,” a combination of the names of George Papandreou, the Greek prime minister who had to resign in absolutely disgraceful circumstances, and of François Hollande, who also looks like he’ll soon be going down the same road. I think the deeper reason why these social-democratic, traditional left, etc. governments are not interested in helping Syriza is that their main propaganda argument is the idea that the choices they make are forced upon them. These aren’t people who talk about some extraordinary program of transformative changes; no, they claim their hands are tied. If Syriza succeeds, then that will prove that their choices aren’t as forced as they say, and that they make them only because they have no properly political answers that would allow them to come up with anything different. For them, that question’s been dead for a long time, ever since — well, I’m getting back to my obsession, but the French experience is relevant to this question — Mitterrand in 1983. When faced with the fundamental choice you mentioned earlier, the government decided to say it couldn’t do any differently. And to avoid talking about austerity, they came up with another word: “rigor,” a “policy of rigor.” A good part of social-democratic politics is like that: coming up with new words for the same thing . . .
And I think that this is an essential point. 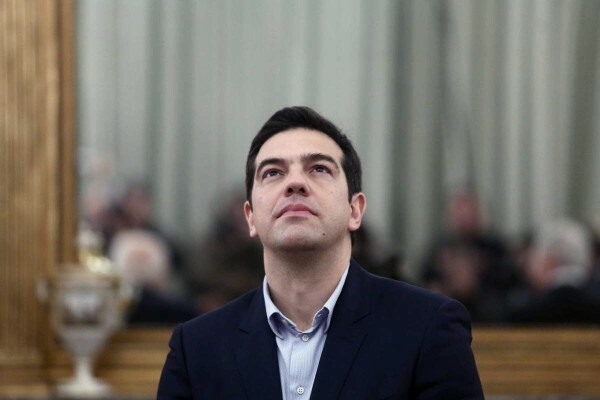 That here, too, you bear an extraordinary responsibility — and when I say “you,” I mean the Greek people . . . and you personally, too! — namely to provide the first demonstration, anywhere in Europe, that in this kind of conjuncture, it’s possible to implement a different policy in practice. That would really be a political earthquake in Europe, if the Greeks could shine a magnificent beacon showing that it is possible to interrupt Europe’s constant neoliberal slide and its being governed according to capital’s financial and economic needs, to use some old-school language . . .
As you say, I think here we see how what is at issue is the specificity of neoliberalism. Also in that it poses an old dilemma in new terms, namely the division between reformists and revolutionaries. Well, reformism requires believing that some progressive reforms are possible — pro-labor reforms, the promotion of welfare, etc. — within the terms of the system. But in neoliberal capitalism that’s not possible anymore. So even to get relatively modest reforms which at other times would have been perfectly compatible with the system’s functioning, we need to have major confrontations and conflicts on a large scale. And we’ve seen as much in Latin America: the countries like Bolivia or Venezuela or Ecuador that have left governments are not socialist, but even this partial break with neoliberalism required lethal struggles: blood was spilt for it to be possible for Evo Morales to be elected. We shouldn’t hide from recognizing the violence of the current situation in Greece, the violence inflicted against Greek society. And you can also see this violence in the fact that neo-Nazis have now become a major political force in a country where they have never had any kind of mass following. But that does have something to do with the collapse of the state, as you mentioned, and the kind of panic these years have created in a certain parts of society. So yes, it is the future of neoliberalism that’s at issue — you mentioned France in 1983, but for me the real laboratory was Pinochet’s Chile, that was when the neoliberal counter-revolution began. And its fate in Europe, on our continent, will perhaps be decided by the South. You mention Chile . . . are you afraid that if the hopes in Syriza collapse this summer — a very important date now facing it — then a formation like Golden Dawn will be able to cause major trouble? I did mention Chile, but the Greeks don’t need that Chilean reference to understand what’s at stake. They’ve experienced it directly themselves. The techniques that were used in Latin America had already been used in Greece in 1967, with the military coup of the colonels. I can even tell you that personally, from my own family’s experience. But I’d say that now the problem is not so much in the army as in the police and part of the judicial apparatus. There’s a risk that they’ll try and deploy a “strategy of tension” in Greece, and we already saw as much during the period when Golden Dawn was on the offensive. And when its leaders were arrested after the murder of the activist rapper Pavlos Fyssas in September 2013, top officials from the police and secret services were also themselves arrested. This was proof of something we already knew, namely the existence of parallel structures in certain parts the state apparatus; they may be silent at the moment, since currently it’s Berlin that’s in charge of the situation, but they might return to the fray in future. So here, the balance of forces in society, and of course the vigilance exercised by the popular mobilizations, are totally indispensable to defeating this kind of threat. I want to ask a final question, on a rather subjective note: are you mainly optimistic? I’m sometimes asked this question, Alain, and I have reflected on it a lot myself. I have to say that personally in these last few months, I’ve experienced things very different from anything else in the previous thirty-five years of my activist life. This is a new kind of subjective condition, if you will. A very great deal of anguish, a lot of excitement, joyous moments, but alternated with much more somber ones — and in none of that are the words optimism and pessimism really appropriate. I think that in the heat of battle, there’s nothing else but the battle, and the will to carry this struggle forward is my sole preoccupation. It’s not that I’ve chosen to put aside all the rest — what’s usually called optimism. Rather, it’s that I feel that it doesn’t really concern this situation. That’s a subjective condition that shows that you’re really at an intense moment of your history. I’ve felt that myself at various moments in the past — a very unique mix of anguish and joy, existing side by side. So I agree with you, it was a stupid question . . .
What would be the reasons for imagining there might be a favorable outcome, this summer? We can see these reasons in the series of events that we’ve lived through this last years: who would have thought five years ago that we’d have got as far as we actually have done? Of course, there was a lot of tragedy in that, but also a lot of extraordinary things. And these reasons also reside in a word that’s usually seen as worn out, but which I believe also has a real content in this case: the word “hope.” It’s a long time since we last had that. Aude Lancelin is a French journalist. She was deputy editorial director of L'Obs from 2014 to 2016 and editor of Marianne from 2011 to 2014.